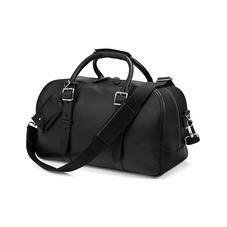 Part of the Harrison Family, we present the Small Harrison Weekender Travel Bag. Handmade from the finest smooth Italian calf leather, the Harrison Weekender in reduced proportions functions as a chic day or overnight bag, perfect for work, the gym and short trips. With styling that will stand the test of time, this semi-structured cabin sized leather travel bag stands on brass base feet for extra protection and boasts a fully adjustable webbing shoulder strap that offers a comfortable alternative to the dual carry handles. The Small Harrison Weekender conforms to IATA & BAA regulation size for carry-on luggage.